State pensions are still payable to those retiring abroad, as long as you have paid the required National Insurance Contributions over the years. However, under current legislation there are many countries where your state pension will not be increased in line with inflation as it is in the UK. More than 550,000 UK pensioners live in countries without reciprocal treaty arrangements. These include Australia, South Africa, Canada, and New Zealand. The House of Lords rejected an appeal from the High Court in May last year. Their four-to-one ruling came after a seven-year legal battle by Annette Carson, 62, who lives in South Africa. Campaigners have now taken their case to the European Court of Human Rights in Strasbourg. According to the Department for Work and Pensions it would cost up to £400 million each year to give the annual increase to all British pensioners who decide to live abroad. The total cost of state pensions is around £40 billion. If you retire in a country that is in the European Economic Area (EEA) or that has a reciprocal agreement with the UK your pension entitlement will increase with inflation, and you should check that your pension is being increased accordingly. The Pension Service International Pension Centre (IPC) deals with queries about UK benefits payable to those living overseas. You can contact them on Int 44 191 218 7777. 150,000 British expatriates living in Canada are receiving some level of UK state pension from the period they worked, paid taxes, served their country, and contributed to the mandatory state pension plan (National Insurance fund) whilst residing in the UK. We believe that there are thousands of others who have an entitlement, based on their contributions whilst living in the UK, but who may not be aware of it and have not applied. Those who have claimed their pensions find them frozen from the date they received their first cheque in Canada and they have never received any uprating. The same situation exists for a total of some 530,000 frozen pensioners world-wide. Many of them, in the two decades after the war, were aggressively encouraged to emigrate to Commonwealth countries by the British Government. 590,000 other pensioners, who contributed in exactly the same way, but happen to live in the EU, USA, Israel, Bosnia-Herzegovina, amongst other countries, receive the same annual uprating as UK-resident pensioners. Although you may not be in great financial difficulty personally, there are many non-uprated pensioners in Canada who are. Even more desperate are those non-uprated pensioners who are living in countries without any social net such as those in South Africa and Zimbabwe. A couple who decided to move to Canada to be near their children, following retirement on a full pension in Britain in 1987, had become a burden on the families by the time they reached their mid-eighties. Th children that they came to Canada to be close to are now assisting mum and dad to make ends meet because their pensions are frozen. By 2006, pension freezing had short-changed this couple more than £42,000 ($85,000) since retirement. If they had lived 80 km to the south, in the USA, their pension would not have been frozen! It is reprehensible to treat these individuals in such a way. No matter how financially secure a frozen pensioner, a loss of such a quantity of money must have an adverse effect on one's standard of living. A direct injection of some $300 million/year into the Canadian economy (2006 estimate). Frozen pensioners will be better able to afford the standard of living they should have expected in their retirement years without becoming a burden on their families. A reduction in Supplemental Income Benefits paid to those individuals currently on lower incomes as a result of their pensions being frozen. Millions of mothers, part-time employees and people who have worked abroad are missing out on the best value pension on the market by not buying back state pension credits. Some 12m people, the majority of them women, are on course to retire without a full basic state pension because they have broken work records. But for just £7.55 a week, roughly the cost of a packet of nappies or a couple of glasses of wine, anyone who does not pay National Insurance Contributions (NICs) can buy a pension worth more than £125,000. That is the pension pot a woman aged 60 would need to buy an annuity to match the inflation-linked income she would get from a full basic state pension, which is currently £84.25 a week. If you have a broken work record, the chances are that you will have received a letter from HM Revenue & Customs reminding you of your right to buy extra entitlement through "Class 3 National Insurance contributions". What that letter will not tell you is what a fantastic deal you are being offered. Buying back missed years of basic state pension entitlement is staggeringly good value, provided you do not expect to be relying on benefits for the majority of your retirement income, which is probably why the Government does so little to advertise it. The Revenue says less than one person in 20 takes up their right to buy back state pension entitlement, which means that a massive number of people with broken work records are missing out. Experts say filling gaps in your National Insurance contribution record with Class 3 contributions, also known as "voluntary contributions", is the first priority for anyone who is not on course to retire with a full basic state pension, particularly for those nearing retirement, who save most by buying back earlier years' contributions. "Making voluntary contributions is a no-brainer if you haven't built up enough to get a full state pension when you retire," says Michelle Cracknell of Origen, the independent financial adviser. "Whether it is women who have had career breaks for children or anybody who has worked overseas for a considerable period, buying back years is the most cost-effective form of pension saving you can make." It costs just £7.55 a week to buy back the basic state pension entitlement, which adds up to £392.60 a year. If a woman paid an equivalent amount into a private pension for the 39 years it would take her to get the full entitlement, she would build up a pot of just £57,264, assuming annual growth of 5 per cent a year on her fund and tax relief of 22 per cent. This is less than half the £125,000 she would need to buy an equivalent income privately through an annuity. Put another way, she needs only to live to just under 64 to be better off. "Most people think £84 a week or £4,400 a year is nothing, but they don't realise how much money they need to get this income when they are retired," says Billy Burrows of William Burrows Annuities. And buying back state pension rights is set to get even cheaper for anyone under the age of 60 on April 6 2010 because the Government is planning to reduce the qualifying period for a full pension from 39 to 30 years for women and from 44 to 30 years for men. A woman under the age of 56 today who is saving in a private pension rather than buying back missing state pension credits would see her pot grow to a meagre £35,019 in the 30 years she could have been buying her state pension worth £125,000. While making claiming back extra years even more valuable than it already is, the new rules, which are expected to go through Parliament before April, also mean fewer people will need to claim extra years to get the full state pension. Last month the Revenue issued a warning that anyone who is currently making voluntary contributions and is on course to retire with more than 30 years' credits may want to stop paying into the state system because it will not make them any better off. You can claim back voluntary contributions for gaps in your National Insurance payments going back as far as 1996, although from 2009 you will be allowed to backdate only six years. If you have already reached state pension age and find you are not entitled to a full basic state pension, you are still allowed to buy back credits as far back as 1996 although you cannot buy them back for the year of your retirement. Parents with children under 16 and people who care for disabled or elderly friends or relatives for more than 35 hours a week get help towards their state pension through Home Responsibilities Protection, but this does not fill in missed years of basic state pension; it simply reduces the number of years someone needs to contribute to get a full state pension. But the basic state pension does not pay out at all if you do not have a minimum 25 per cent of the contributions you need for a full pension. This means that even though Home Responsibilities Protection could reduce the number of years you need to qualify for full pension to perhaps 20 years, if you do not have five years' contributions you still get nothing. This can mean that many women who do not work because they are looking after children or are stuck in part-time jobs below the National Insurance threshold can end up with no basic state pension at all. Married people who have not worked throughout their working life can opt to be treated for state pension on their spouse's contribution and will receive 60 per cent of their entitlement. Alternatively, they can buy extra years if they think this will take them above the 60 per cent pension they would get through their spouse. Where both spouses have a full contribution record, both receive the full pension of £84.25p a week. The Government's pensions White Paper proposes changing this complex system to make it fairer to non-working parents and other carers. Changes are set to take effect in 2010 and a lot of people will no longer need to make voluntary contributions. But despite this, millions of people, whether they reach 60 before then or not, could be missing the bargain of a lifetime by not buying back those years they have missed out of the National Insurance system. How do I know whether I should claim or not? You need to get a pension forecast by completing form BR19 at the Pension Service website www.pensionservice.gov.uk. Alternatively, you can seek advice by telephoning the HM Revenue & Customs National Insurance inquiry line on 0845 302 1479 or by contacting the State Pension Forecasting Team inquiry line on 0845 3000 168. You can then calculate whether you will have enough years' contributions by the time you retire. How many years' contributions do I need to get the full basic state pension? Women currently need 39 years and men need 44 years. However, from 2010 this is expected to be reduced to 30 years for both sexes. This means anyone born after April 5 1950 will need only 30 years' contributions for a full pension. Why do men have to pay more than women? This is because the retirement age for women is currently 60 (but it will rise to 65 by 2015). If you are a man aged between 60 and 65 and you are not paying contributions on earnings because, for example, you have taken early retirement, you will get NI credits. Are there any other benefits of paying National Insurance contributions? Your spouse will get a bereavement payment in the form of an immediate tax-free lump sum payment of £2,000 if he or she is widowed before you draw the state pension. How are voluntary contributions paid? You can pay by cheque direct to HR Revenue & Customs for previous years. You can pay for the current tax year by direct debit. Will anyone lose out by buying extra years? Some people on very low incomes will lose out because their means-tested benefits will be reduced. Buying extra years is less beneficial for younger people because the money they pay into the system would grow for longer if it was invested rather than put into the state pension. ALL WELCOME at the following meetings - - Come and watch our new Video on the progress being made and the latest position on the legal challenge against the UK Government's pension freezing policy currently before the European Court of Human Rights. 7755 Bayview Avenue at John St.
Expats Bob and Christine Hardwicke, of Gawler, South Australia, have been devasted by the news that they owe over $A9,400 to Australia's social security department, Centrelink. The couple emigrated in 1971 and worked in Australia for nearly 30 years. Six years ago, when they applied for a means-tested Australian old age pension, they were obliged to declare any income they received from other sources. These included their combined partial British pension of about £15 ($A37.69) a week. But this was incorrectly logged by Centrelink as a monthly, instead of a weekly, payment. "The upshot is that we've been overpaid for about six years," said Mrs Hardwicke, 69. She said she and her husband first became alarmed when a neighbour told them she had received a Centrelink bill for $A6,000 because her supplementary British pension had been incorrectly coded. When the Hardwickes heard of another similar case, they "started doing sums" and contacted Centrelink. Their worst fears, confirmed at an initial meeting, were followed by the arrival in the post of bills for $4,730.67 apiece. A campaign has been launched to earn British pension rights for the Maori, the indigenous people of New Zealand. The claim is based on the 1840 Treaty of Waitangi, the document that handed sovereignty over New Zealand to Britain, ruled at the time by Queen Victoria. Article Three of the treaty guarantees Maori "the same rights and privileges as British subjects." The campaign is being led by David Rankin, a direct descendant of Hone Heke - the first of dozens of Maori chiefs to sign the treaty. Mr Rankin, leader of the Matarahurahu hapu or sub tribe, said that he would also investigate Maori entitlement to other perks of British citizenship. "We may expand the claim to include British passports, unemployment benefits, and other entitlements," he said. In return for British protection, the Treaty of Waitangi granted the Maori the rights of British subjects. They were also allowed to retain control of their lands, forests, fisheries, culture and language. Tony Blair was accused yesterday of leaving millions of pensioners to "rot in poverty" by denying them a decent living before they died. In a mass lobby of Parliament, hundreds of pensioners urged MPs to restore the link between pension increases and earnings immediately. They also called for the basic state pension to rise for all from £84.25 a week to £114, the minimum income guaranteed to poorer pensioners. 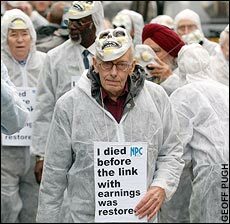 , some dressed up as skeletons to illustrate their claim that three million old people would die before Labour fulfilled its pledge to restore the link in 2012. Others took aim at MPs' generous pensions, with protesters wearing T-shirts depicting a grinning Mr Blair playing When I'm 65 on the guitar and saying: "I'll have a fabulous pension – too bad about you lot." , angrily complained that war veterans and people who had worked all their lives to build up the country were now "just left to rot in poverty". But the Government made clear it yesterday that it would not budge, saying that it would cost £10 billion by 2010 to bring the promise forward. It was the Thatcher government in 1980 that scrapped the system whereby annual pension rises were automatically linked to rises in earnings. The state pension now rises in line with inflation. In what one Labour MP described as a "gritted teeth" decision by Gordon Brown, the Government has now promised to restore the link in six years' time. David Cameron's Conservatives support restoration of the link and said they were "happy" with the Government's timetable. But the National Pensioners' Convention (NPC) organised yesterday's rally to call for its immediate restoration. Joe Harris, NPC general secretary, accused the Government of "breathtaking complacency" by not restoring the link now as one in five pensioners was below the poverty line. More than 80 MPs have already signed a Commons motion calling for the link to be restored "as a matter of urgency". And yesterday, Kelvin Hopkins, Labour MP for Luton North, told the rally that "more tax for the rich" could help pay for it. August, rebuked Mr Blair for failing to "roll back Thatcherism" and restore the link. But he told an audience of about 400 pensioners: "The Government is panicking because we're starting to win the argument." This explains the mechanism by which pensions are frozen and what needs to be done to reverse the annual ritual. The state pension is worse in Britain than in any other European country, according to a report yesterday. Countries such as Slovenia, Estonia, Latvia and Slovakia were all said to give their pensioners a better deal. 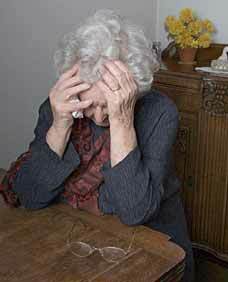 The charity Help the Aged said one in five pensioners is living in poverty in the UK due to the inadequate state pension, currently £84.25 a week. A spokesman said it had "utterly failed to keep pace with the cost of living to support pensioners". The most recent annual increase in the state pension was only £2.20 a week, which does not keep up with inflation-busting rises in household bills. He said it was time for the Government to address the "shocking levels of pensioner poverty" by bringing forward the introduction of the link between pensions and earnings, which is scheduled for 2012. "Our pensioner population should be entitled to retire with dignity and without the need to apply for means-tested benefits," the spokesman added. The research, European Pensions Barometer, which was published by pension consultants Aon, compared the "adequacy" of state pension in all 25 members of the European Union in 2006. It ranks "adequacy" by comparing the size of the basic state pension to the country's average salary. Luxembourg came top. For total pension provision, including both state and private pensions, Britain was ranked sixth. Aon fears, however, that the UK will slip down the ladder as company pensions become increasingly miserly. An Aon spokesman said: "We used to have the best company pension provision in Europe, but we are seeing that dwindling. "We are going to slip down the table as more employers switch from generous defined benefit pensions to less generous types of pension." "The pressure is definitely downwards. There is little chance of Britain going up the rankings." According to the report, in the past "strong" company pensions compensated for the "inadequacy" of the state pension but this is changing. Donald Duval, chief actuary at Aon, said: "The key risk for countries such as the UK is that companies are withdrawing defined benefit schemes because of the rapid rise in the costs of such schemes." These gold-plated pensions are so attractive because they pay a guaranteed percentage of final salary, typically two-thirds. Another reason for their popularity - and their rapid disappearance - is that bosses pay more money into them than into other types. Defined benefit pensions have also become too expensive for Britain's 23 million private sector workers because people are living so much longer. Nearly 60 per cent of final salary pensions are closed to new workers when they join the company. In some cases, even existing workers are being told that must switch into a less generous pensions. A spokesman for the Department for Work and Pensions said the Aon report failed to reflect its plans to improve the state pension, such as restoring the link to earnings. "By restoring the link to earnings and modernising the contributory principle, we will make the state pension much more generous and fairer to women and carers," he said. Tom McPhail, head of pensions research at the financial advisers Hargreaves Lansdown, partly blamed Gordon Brown for the collapse in defined benefit pensions. One of the Chancellor's first moves when he came to power in 1997 was to scrap the dividend tax credit on pension funds, described by the Tories as one of the "great scandals of the last decade". Thousands of Britons have been wrongly refused a pension after being told they had not contributed to the National Insurance Fund for the minimum qualifying period. The minimum qualifying period for National Insurance Contributions (Nics) is 11 years for men and 10 years for women. But those who had paid Nics for at least three years should have been told they could top up their contributions to bring them in line with this minimum. If they had done this, they would be eligible for a quarter of the pension they would have received if their contributions were complete. This oversight first came to light in 2001 when a Canada-based expat complained, in a letter to the journal of the Canadian Alliance of British Pensioners (CABP), that he had been denied the option of topping up his contributions. His protests attracted investigations by expat pensioner organisations, and eventually the UK authorities admitted there had been bungling and set about trying to make amends. This entailed examining the records in an effort to trace the whereabouts of those who had been penalised by the blunder, which dated back to the mid-1990s. They included expat World War Two veterans and other Britons who had contributed to the NI fund for almost a decade before emigrating during the 1950s. It would have been particularly difficult to trace them had it not been for the painstaking efforts of expat organisations around the world. They have used their websites and newsletters to alert their members to the possibility that they - and perhaps their expat friends and neighbours - have been denied a British pension in error. The chairman of the British Pensions in Australia organisation, Jim Tilley, has been busy lodging claims on behalf of members around Australia. They include the widows of deceased British pensioners. The UK's Department for Work and Pensions (DWP) seems anxious to expedite matters and to cut as much red tape as possible. In some cases the required top-up contributions are now being deducted by the DWP from accrued back payments - the retrospective pension payments these expats would have been entitled to regularly receive over the years had it not been for the oversight. Mr Tilley said several of his members have been delighted to learn that not only will they now receive an on-going regular partial pension, but also the windfall of a one-off lump sum back payment. Even after the deduction of the required top-up contribution, back payments usually add up to between £4,000 and £5,000. The president of the British Australian Pensioner Association, James Nelson, is also dealing with constant inquiries, although he stresses that while he is always ready to advise callers about how to lodge a claim, he encourages them to liaise directly with the DWP. His association has also been busy lately on behalf of expats who are members of public sector pension funds. As reported in Issue 829 of the Weekly Telegraph, many of these expats do not realise that a portion of their pension, the GMP or Guaranteed Minimum Pension portion, should be regularly uprated in line with inflation, even if they are resident in one of the Commonwealth countries affected by the UK's frozen pensions policy. Mr Nelson has repeatedly complained that bureaucratic indolence and ignorance of the rules has led to thousands of expats forfeiting the regular uprating of the GMP portion of their pensions. He recently won an increased pension and a lump sum back payment in excess of £10,000 for a Queensland-based member, retired school teacher Joy Waterhouse. She said she would never have realised she was being short-changed had it not been for Mr Nelson's efforts. As a result of the frozen pensions policy, expats in Australia, Canada and most other Commonwealth countries have not had their basic state pensions uprated in line with inflation since they left the UK. The latest official figures reveal that 244,971 British pensioners are currently living in retirement in Australia. Around 170,000 of these expats now draw a means-tested Australian pension or partial pension, either because they cannot make ends meet on a long-frozen UK pension, or because they are not entitled to a UK pension. It is important for expats to remember, though, that the Australian social security authority, Centrelink, requires its customers to immediately report any change in circumstances. Both Mr Tilley and Mr Nelson stress that expats negligent in this regard can find themselves faced with charges of non-compliance - otherwise known as social security fraud. Yet Mr Tilley and Mr Nelson also advise that a DWP back payment, or the advent of a partial or increased British pension, will not necessarily result in the reduction of an expat's Australian pension. Mr Tilley said: "It will depend on your total income from all other sources. Your Australian pension will not be affected unless your income from other sources exceeds about £120 a month (or £240 in the case of a couple)." The principal work of the expat pensioner organisations remains legal action for the repeal of Britain's frozen pensions policy. The freeze does not apply to expats who retire to EU nations and most other non-Commonwealth countries. Campaigners, led by the CABP, have now taken their case to the European Court of Human Rights.